Several years, ago – we’re talking in the decades now – before the internet and e-mail….you know, back in the dark ages…I visited the Muskogee County Genealogical Society in Muskogee, OK. I was that certain that my oral family history of Cherokee heritage was accurate – I traveled from Indiana to Oklahoma to find and claim my Cherokee heritage. After all, I had it in writing in letters, for several generations. But I was, ahem…..wrong. I was quite unsuccessful when I was there, which made me wish I had prepared better. Yes, I was exceedingly “green” at the time, and exceedingly excited, and horribly shocked at the outcome. I just didn’t believe it was true. I had no Cherokee ancestors, at least none on the rolls? 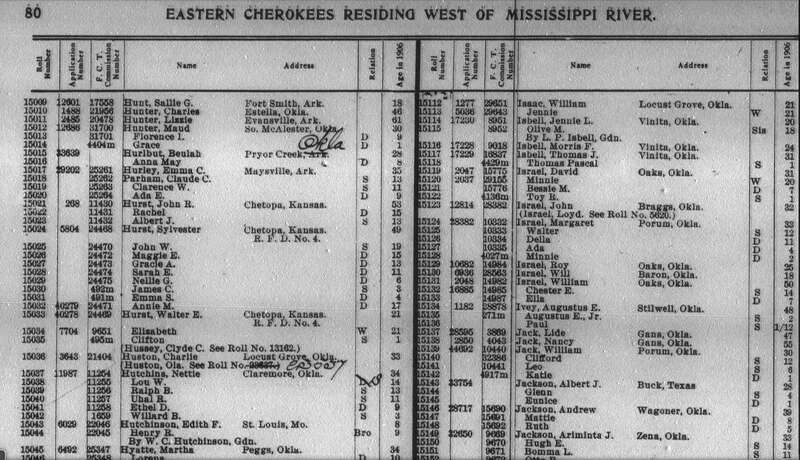 My great-grandfather lived on Choctaw land!?! And we’re not Indian? Well, we’re not on the rolls, that’s for sure, and that translated into “not Indian,” at least legally speaking. So, if you’re researching and you wind up throwing yourself out of the family tree…I feel your pain. It happens, and it’s part of searching of the truth. Now my prep for a research trip far exceeds the length of the trip itself. When I was in Muskogee, they sent me away with some hints, and I’m going to paraphrase them here and update them to the internet age with online resources. In 1962 a payment was made to living Cherokee individuals whose ancestors appeared on the Dawes Roll. It was necessary at this time to complete the “Proof of Death and Heirship” application to qualify for the payment. This probably explains why there was a sudden increase in people who were suddenly “Cherokee” beginning about this time and moving into the 70s and 80s. If there was any family history of Native heritage, it would have surfaced at that time. If you do have a family member who received a payment, they will be able to identify your ancestor who was on the Dawes Commission Rolls, which was the requirement to qualify. If you can do this, you’re nearly there. On the “Proof of Death and Heirship” application we find the name, roll number, place and date of death of the person on the roll and the descendants with their addresses. In Cherokee research, everything ties back to the roll number. To obtain a roll number, you had to prove descent from someone on the original Rolls at the time of, or following the removal and resettlement in the 1830s. You can search the Dawes Rolls here and here. The Dawes Rolls give the census card number which will give the 1880 or 1896 Tribal Enrollment Number. The information on the Census card is taken from the Dawes application or enrollment. Often, applications that were denied have more information than the applications that were accepted. You may have to order the application packets from the National archives for denied applications. 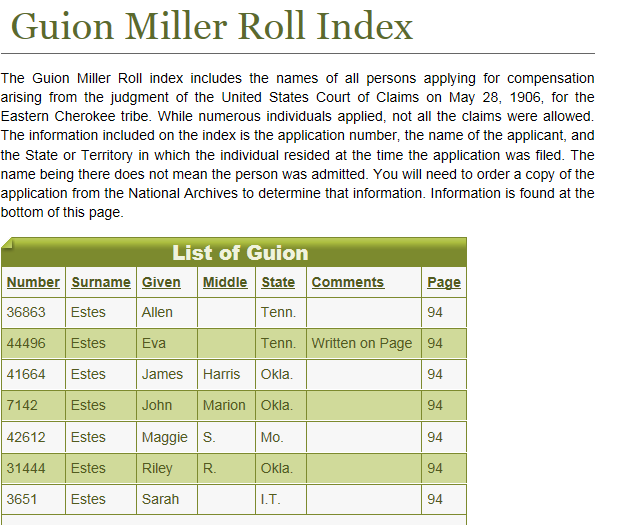 Next, search the Guion Miller Roll of 1909 for members of the Eastern Roll of the Cherokee. You can search here and here. The second column from the left is the application number which is used to find the application which provide information back to 1851, including Indian names. To order copies of the Guion Miller Roll applications from the National Archives, you must submit a completed NATF Form 83 which includes the individual’s name and application number. A separate form must be completed for each file you wish copied. To order an NATF Forms 83. You may also Order Individual Records online for a fee of $17.50. Orders take about 56-70 calendar days. You can also search the Final Roll Index here. At www.fold3.com, a subscription site, you can find the actual application packet. You can also find it, or request it, from the National Archives branch in Fort Worth, TX. 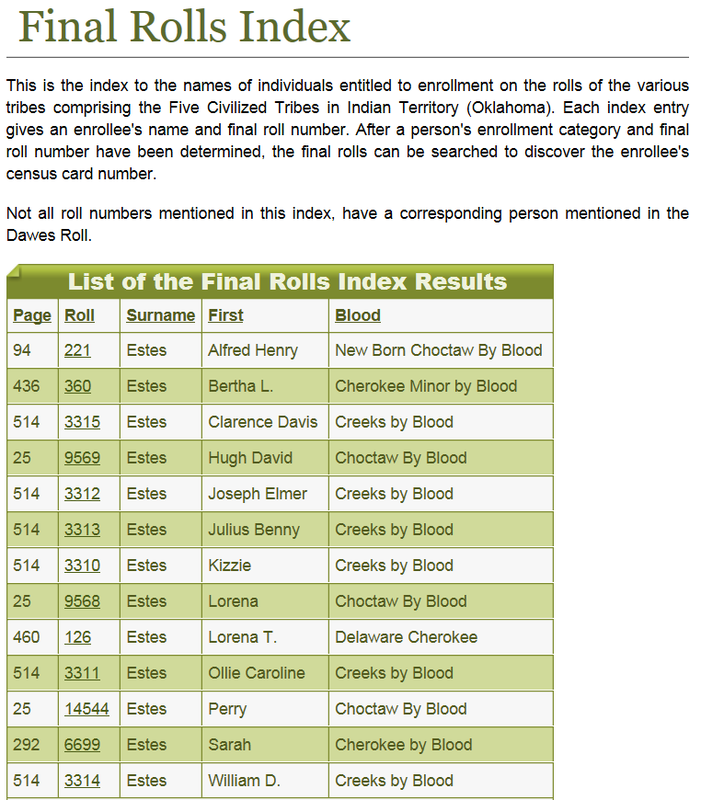 After finding your ancestors on any of these rolls, check all of the rolls, because at some point, your ancestor may give their Native name, not their English name, and earlier rolls are more likely to have your ancestor recorded by their Native name. There are several pre-1851 and a few later rolls that you’ll want to check, most indexed and available free at Access Genealogy. 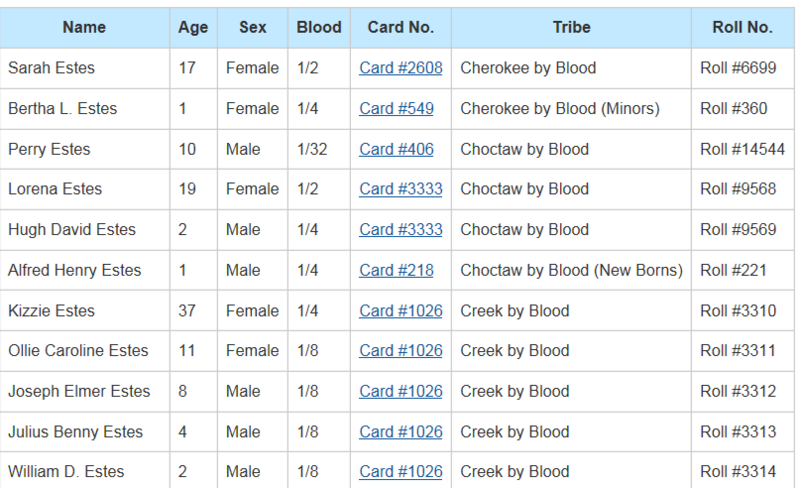 Here’s another resource for 5 Civilized Tribes research, including the Cherokee, Choctaw, Creek, Chickasaw and Seminole. Additional resources can research assistance can be found here. 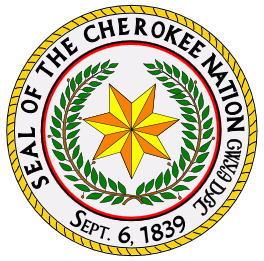 Information about joining the Cherokee Nation, the Eastern Band of the Cherokee and United Keetoowah Band of the Cherokee. Very nice summary, and thanks for the links, too. I had a similar shock some 15 years ago and have become dismayed more than a few times in my quest. I’m not interested in money or even being official. I just want to learn the truth, and along the way am learning so much more history than I had the taste for when a schoolgirl. Anyway, new follower here, nice to meet you! I keep finding folks on my family tree that are on the final dawes roll, but haven’t found my direct link. I am older, most ancestors are gone. I probably have one of the largest trees with Native American ancestors, all surrounding me, but haven’t found the direct link to me. What do you suggest as a next step? I am currently searching my ancestry. I have some mystery ancestors that I have come to a dead end on. Abigail Jane Curtis b. 1827 NY State, who was married to (1) Benjamin F Cary, in Ohio, (2) Garry C Gibson, in New York. I obtained her death cert. and it said her father was Asa Curtis, mother was Elsa Chambers. I can not find anything with Elsa and Asa together. I have another, Permelia L Curtis, b. NY, married to Archibald Lemmon, in Ohio (same county as Abigail). I suspect they are sisters but can’t find Permelia’s death date or place. I have many DNA matches to the Cherokee, but have no idea how. I was told another family name was Chisholm but have not located any Chisholm’s in my tree so far. I suspect the relation is on the Curtis/Chambers side. I am not looking for any kind of enrollment etc. I just want to find out who my ancestors are so future generations know their entire family tree. If anyone has suggestions I would greatly appreciate them. Im a descent of Andrew Jackson Bass. He a sister her name is Martha Eleanor Bass and her son Andrew Benjamin Bass. Im trying to find my indain roll number. Andrew Jackson Bass,Martin Van buren Bass,Ethen Van Buren Bass,Amy Lona (Bass) Parsons,Roy Sam Mattoon Parsons. Andrew Jackson Bass is full blood Chickamauga Cherokee. I am trying to research an ancestor named Luie Bean, and she lived in the late 1800s in Tennessee, and was supposed to be a full blooded Cherokee medicine woman. CAN ANYONE HELP ME? I FORGOT TO MENTION THAT LUIE BEAN’S HUSBAND,S NAME WAS MARION FRANCES “PETE” O’NEAL. THANKS! I have a ancestor named Luie Bean who was supposed to be a full blooded Cherokee medicine woman, and her husband was a white man named Marion Frances “Pete” O’Neal, she lived in the late 1800s Tennessee. IF ANYBODY FINDS MORE INFORMATION ABOUT HER THAN PLEASE LET ME KNOW! THANKYOU!